POLICE are imploring the driver of a car allegedly involved in a deadly race on Pali Highway yesterday to come forward. The driver was racing with a Kailua man who was killed when his car plunged off the Pali Highway and landed 40 feet down a ravine, police said. "We're not interested at this time in pressing charges," said Capt. Frank Fujii. Any information provided by the driver will help the family of the dead driver understand what happened, he said. The Honolulu Medical Examiner's Office identified the victim as Terance Daniel Lee,* 35. He was found under his white 2004 Nissan 350z about 20 feet below the highway, just outside the second tunnel in the Kailua-bound lanes. According to traffic investigators, Lee was traveling at a high rate of speed at about 1:35 a.m. When Lee came out of the tunnel, his car hit the right-side concrete jersey barrier, slid along the barrier and then went airborne about 200 feet before crashing into the mountainside and coming to rest in the ravine. Honolulu Fire Department officials who rappelled into the ravine to retrieve the body said Lee was ejected from his car and ended up underneath his vehicle. Police confirmed Lee was not wearing his seat belt and suffered a fractured skull and other internal injuries. Speed and alcohol also appear to be factors in the crash, according to investigators. According to witnesses, Lee had been racing someone in a black or dark-colored car. "The driver of the other vehicle actually stopped for a little bit" before leaving, Fujii said. Police did not have any other information about the second car. "According to the 911 caller, they were traveling at an extremely high rate of speed," Fujii said. Racing continues to be a problem on Oahu. "To date, we have issued 186 citations for racing (this year)," Fujii said. Last year, Honolulu police issued 199 tickets for racing. "People make conscious decisions to do what they do, and the results can be catastrophic," he said. Of the 77 traffic fatalities on Oahu so far this year, 23 were speed-related and 11 were alcohol-related, Fujii said. During the same period last year, there were 69 fatalities. Tow-truck driver Sal Taito said he rappelled to hook up the car and used a heavy-duty truck to bring it up. Taito found the car upside down, perched on its roof. "The whole car was smashed up," he said, adding that the car must have been traveling at a high rate of speed to go over the guardrail and receive so much damage. "When it came down, it did a lot of damage, too," he said. Traffic investigators closed the Kailua-bound lanes of the highway at Waokanaka Street for several hours as they investigated the crash. Windward-bound motorists were forced to use Likelike Highway, the H-3 freeway or go around Makapuu Point. The investigation was completed before daybreak. However, the highway remained closed for more than 7 1/2 hours until 9:30 a.m., allowing tow-truck operators to retrieve the car from the ravine during daylight hours. "We ask the public to remember that in cases like this there is a criminal act, and we want to conduct an investigation that is thorough," Fujii said. HPD now has a policy allowing single-vehicle fatalities to be investigated by patrol rather than the traffic investigators from the Vehicular Homicide Section. 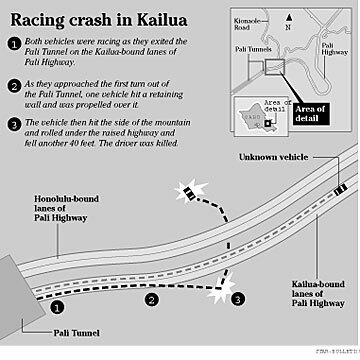 » A 35-year-old driver killed racing on the Pali Highway was Terance Daniel Lee. An article on Page A1 in the Dec. 29 afternoon edition spelled his first name incorrectly.